Having trouble? Visit this help center article. The Top AdSense Content report allows you to see more details about specific pages on your site and analyze ad performance. For instance, if you find that some of your pages generate a high number of pageviews but aren't monetizing as well as other pages, you can focus your optimization efforts on improving these pages. The Top AdSense Referrers report can help you see how different incoming traffic sources contribute to your revenue. Last, the AdSense Trending report lets you analyze how your site generates revenue during different times of the day and different days of the week. 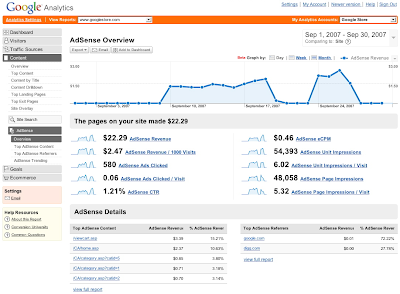 You'll also notice that other sections of your Analytics account will show a new "AdSense Revenue" tab. You'll be able to compare how much of your AdSense revenue is coming from new visitors versus existing ones, and view revenue based on user language. Enjoy your new data, and be sure to visit the Help Center if you have other questions about linking your accounts or reviewing your reports. Like the new feature? Hate it? Leave a comment and let us know!